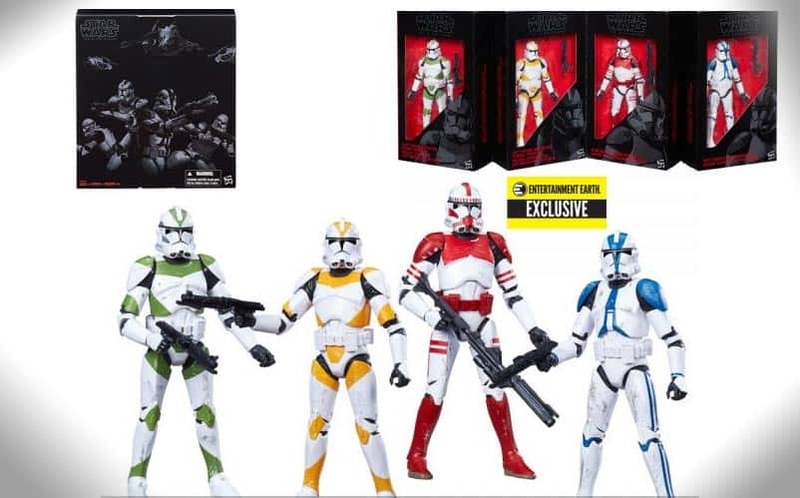 Star Wars The Black Series Order 66 Clone Troopers | Nerd Much? Or as we prefer to look at them: if Clone Troopers were Power Rangers. We’ve seen some absolutely fantastic Star Wars The Black Series figures over the past few years, including the new Rogue One figures that released last month. But, I don’t think we’ve seen any so…colorful. The new Black Series Order 66 Clone Troopers basically look like Fruit Stripe gum when they’re all standing next to each other. These figures are an Entertainment Earth exclusive, and they’re only sold in a set of four. 501st Legion Clone Trooper – The Grand Army of the Republic’s finest battalion, these blue-striped soldiers became “Vader’s Fist,” helping the Sith Lord carry out his slaughter of the innocents at Coruscant’s Jedi Temple. 212th Attack Battalion Clone Trooper – Identifiable by their distinctive orange-trimmed armor, the 212th defeated Separatist battle droids on Utapau – but, during Order 66, they came close to making Obi-Wan Kenobi their final victory. 442nd Siege Battalion Clone Trooper – Don’t let their armor’s cool green accents fool you: The clones of the 442nd were experts at making the fortresses they besieged, such as those on Cato Neimoidia (where Order 66 claimed Plo Koon) feel some serious heat. Shock Trooper – Bred in secret on Coruscant under Palpatine’s personal supervision, these “peacekeepers” with angry red armor plating became the Emperor’s personal security detail after Order 66 (prefiguring the later Imperial Guard, cloaked head-to-toe in crimson). These new Order 66 Series Clone Trooper figures look especially great in their original packaging, and fair warning: you’re going to have an internal struggle with taking them out of the box versus leaving them on display. These figures are available for pre-order now, and they’ll ship in November, just in time to make our list of the best nerdy gifts. Buy the Order 66 Clone Troopers here. For more really cool stuff, stay tuned to Nerdmuch.com for daily finds. You can also follow us on Twitter for timely updates and give us internet high fives if you’d like.